Ron gets deals done. With drive and determination, he ensures that every detail of a transaction is managed to meet client goals. 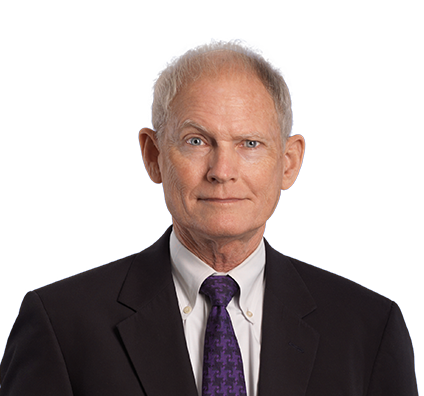 With more than 30 years’ experience, Ron has handled acquisitions, dispositions and loans on commercial and industrial properties and vacant land totaling more than $2 billion in value, and varying from $1 million to nearly $200 million. He is a trusted counselor in sophisticated real estate transactions that involve a property’s entire life cycle. Ron advises developers and investors on the acquisition, sale, financing, operation and disposition of real property, along with title-related matters, surveys, preparation of leases, reciprocal easement and operating agreements, restrictions and covenants. His property representations have included commercial, industrial and mixed-use developments; office buildings; apartment complexes; vacant land; and space and ground leases. He represents one of the largest real estate investment trust (REIT) shopping center developers in the country and regularly serves as lead attorney for transactions involving malls, neighborhood shopping centers and peripheral land, including purchase and sale agreements and ground leases. Before entering law practice, Ron was a First Lieutenant in the U.S. Army Infantry. Served as lead attorney for publicly traded real estate investment trust (REIT) in acquisitions and dispositions of shopping centers totaling nearly $1.5 billion from 2012 to 2018. Served as lead attorney for publicly traded REIT in nearly $200 million acquisition of Mayfaire Town Center in North Carolina. Advised shopping mall developer on purchase of two enclosed malls in North Dakota. Served as lead attorney for negotiation of title insurance policies with major underwriter for purchaser of 21 enclosed shopping malls. Served as lead attorney in negotiations for purchase and sale of more than 50 retail developments. Represented nonprofit organization in formation of condominium of existing commercial building in riverfront area of downtown Chattanooga, Tennessee, and purchase of largest unit. Advised major life insurer on loan and real estate transactions in Tennessee. Served as lead attorney in acquisition of nearly 100-acre closed riverfront industrial facility located in Opportunity Zone in downtown Chattanooga for redevelopment as mixed-use facility. Ron has a passion for adventure travel and enjoys venturing off the beaten path. He has journeyed to Antarctica, Greenland, Galapagos Islands, Denali National Park & Preserve in Alaska, Hawaii and Mount Aetna in Sicily. One of his most significant adventures was hiking the Inca Trail to Machu Picchu. 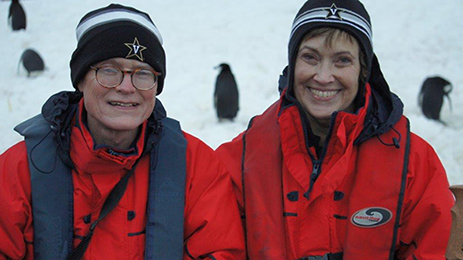 Ron and his wife, Dana, get up close to a waddle of penguins in Antarctica. 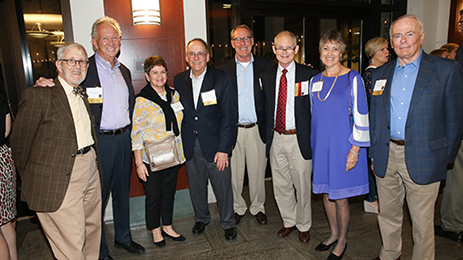 Ron reconnects with fellow Vanderbilt University Law School alumni at a reunion.